The U.S. Department of Housing and Urban Development (HUD) announced it approved Colorado’s Community Development Block Grant - Disaster Recovery (CDBG-DR) Action Plan. The Plan outlines how Colorado will distribute $62.8 million in grant dollars received from HUD for flood recovery programs. This is the first of three rounds of funding. Larimer County's Loveland Housing Authority has been awarded $4 million in CDBG-DR funds from this first round of funding. This funding may be used to help eligible primary resident homeowners with approved projects including home repairs and in some cases private roads and bridges through the Home Access Program. Additional programs for rental and down payment assistance are also available. There are strict eligibility requirements but applications are now being accepted. For additional information, please contact our case managers at 970-461-2222. 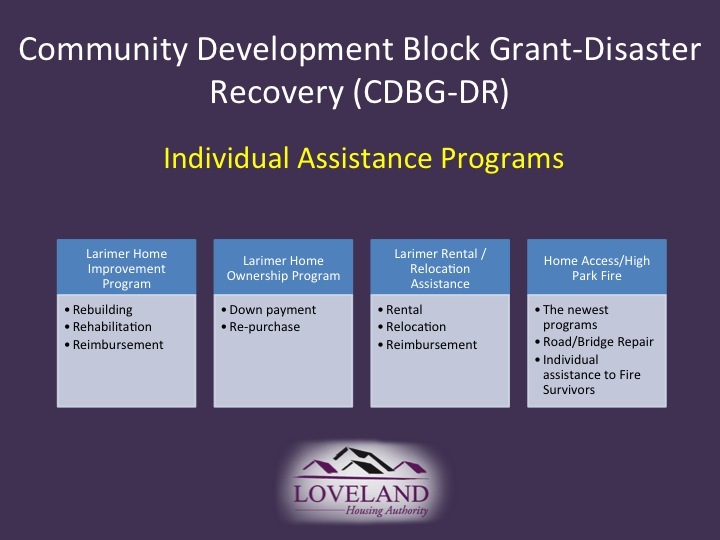 Video: Amy Irwin, Housing Programs Manager of the Loveland Housing Authority gives an overview of CDBG-DR programs managed by her office to assist individual families with flood recovery. This video was taken in August 2014 at the Roadmap to Recovery Expo in Estes Park. For the latest information about CDBG-DR programs, please call our office at 970-461-2222. Presentation: Powerpoint slides used during the above video presentation. To pause the slides just lick on the "pause button" on the lower left corner. This presentation was given in August, 2014 at the Roadmap to Recovery Expo and may not be the most current information regarding CDBG-DR. For the latest information, please call our case management office at 970-461-2222.